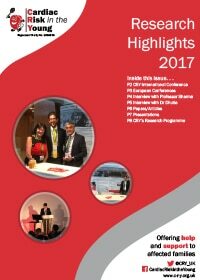 CRY has contributed to the following papers, reports, abstracts and conference proceedings. 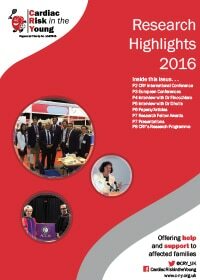 All these articles have been authored (or co-authored) by cardiologists, doctors and research fellows working closely with CRY. Where possible, a link has been provided to the abstract and / or full text of the article. 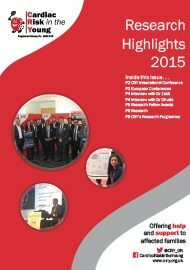 Where no link is available, you may be able to get hold of the article via your nearest public / university library. References are listed by year of publication. I have been involved with CRY since 1996 and they have facilitated several research projects relating to regional/national British athletes. Most of the work was generated from cardiovascular evaluation of athletes as part of a screening programme aimed to identify disorders capable of causing sudden cardiac death. We evaluated several thousand athletes aged 14-35 years and had many “firsts” in the scientific literature. CRY were the first to provide information on the physiological upper limits of cardiac dimensions in adult National British athletes (Published in European Journal of Applied Physiology). CRY were the first organisation ever to characterise cardiac dimensions in a large cohort of adolescent athletes, who are most vulnerable to sudden death during sport from cardiomyopathy. Landmark studies in the Journal of American College of Cardiology and Heart are the main international studies on this subject. CRY wrote the first paper on ECG changes in adolescent athletes (1000 athletes studied) which was published in the British Journal of Sports Medicine and is a blueprint for the European Society of Sports Cardiology. CRY have performed the only study on cardiovascular adaptation in athletes of West African origin. The results show that ECGs in black athletes are quite different to those in white athletes and could be mistaken for serious cardiac disorder. CRY are the first organisation to state the prevalence and significance of an isolated long QT interval in elite athletes. This study has called for revision of consensus guidelines published by the American College of Cardiology. CRY is the first to describe the prevalence of HCM in elite athletes. The scope of the cardiovascular PHE is to detect potentially lethal cardiovascular disease in elite athletes and start appropriate management to reduce the risk for sudden cardiac death and/or disease progression in a timely fashion. Dr Michael Papadakis answers some of your questions about their recent research publication identifying the importance of routine ajmaline testing after a SADS death. Q.
M. Muggenthaler, E. Petropoulou, S. Omer, M.A. Simpson, H. Sahak, A. Rice, H. Raju, F.J. Conti, L.R. Bridges, L.J. Anderson, S. Sharma, E.R. 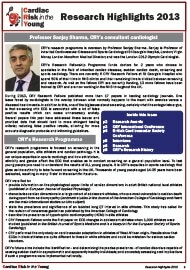 Behr, Y.
Dr Nabeel Sheikh talk from the European Society of Cardiology Conference 2014. Interpretation of Repolarisation Changes on a Young Athlete’s ECG. Sheikh, N., Papadakis, M., Ghani, S., Zaidi, A., Gati, S., Adami, P., Carre, F., Schnell, F., Avila, P., Wilson, M., McKenna, W. and Sharma, S.
Reduced mortality in former Tour de France participants: the benefits from intensive exercise or a select genetic tour de force?